Associate Director B.B. Craig, Chief Cheryl Smith, and U.S. Forest Service Chief Tom Tidwell stand at the top of the chute while Kisatchie National Forest Supervisor Eddie Taylor and Regional Forester Tony Tooke hold the fire bucket catching the quarters during the ceremonial coin pour. 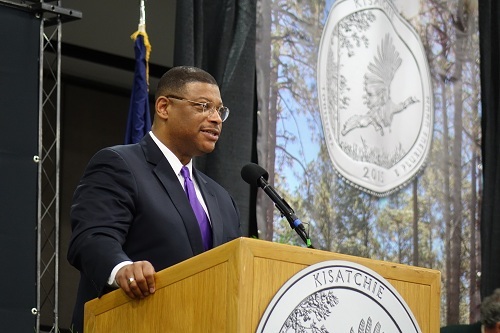 The Kisatchie National Forest quarter, the 27th coin in the America the Beautiful Quarters® Program, made its official debut at the Alexandria Riverfront Center in Alexandria, La., on April 22, 2015. 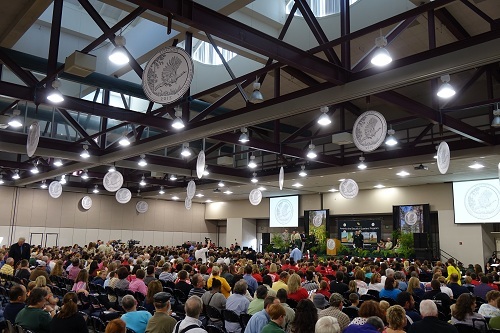 More than 1,500 people packed the convention center, including 900 school children. B.B. Craig, Associate Director for Environment, Safety and Health represented the United States Mint at the event. Other participants included Tom Tidwell, Chief of the United States Forest Service, Regional Forester Tony Tooke, Kisatchie National Forest Supervisor Eddie Taylor, Chief Cheryl Smith of the Jena Band of Choctaw Indians, and Fort Polk Garrison Commander Colonel Glenn Moore. Guests arriving at the event were treated to performances by the Peabody Drum Line and Dance Team and the Pineville High School Band and Orchestra. Jim Caldwell, Staff Director for Public Affairs, Heritage and Recreation at Kisatchie National Forest served as the Master of Ceremonies and the Leesville High School JROTC Color Guard presented the colors. Mrs. Rosa Fields, the First Lady of Pineville, sang for the crowd and two students from the Caroline Dormon School shared quotes and stories from Caroline Dormon’s life – the Louisiana native who tirelessly advocated for the creation of Kisatchie National Forest in the 1920s. The event culminated with a coin pour down a tin chute into a hundred-year-old metal fire bucket. 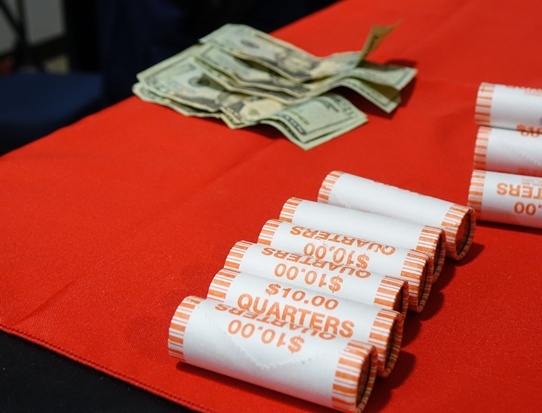 Attendees were among the first in the nation to get newly minted Kisatchie National Forest quarters during the coin exchange that followed the ceremony. Red River Bank exchanged $34,000 after the event. The evening before the launch, the U.S. Mint hosted a coin forum at the Kent House Plantation in Alexandria, La. A crowd of 93 people heard B.B. Craig speak about U.S. Mint’s Order Management System and answer questions from the audience. To see additional photos from the event, check out the Mint’s Facebook page.